Ember Walsh is a trusting soul with the quiet beauty of her late mother, who perished in a mysterious car crash when Ember was three. 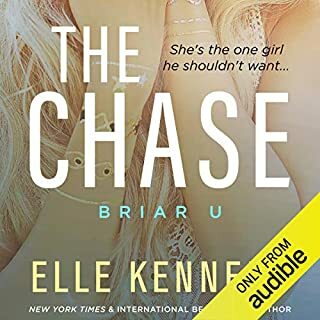 A little tomboyish from being raised by her father, Ember packs a punch when a stranger gets pushy with her in a bar, catching the steely blue eyes of a tall, gorgeous tattooed man — Trace Montgomery. Still damaged from her last disastrous relationship and warned off the bad boy by friends, Ember fights the smoldering heat that Trace sparks in her when he begins shadowing her like a dark angel. Words like unnatural and impure started the whispers. From the very beginning, Ivy Blackwood was different. She was only a child when she was accused of setting the fire, one she passively watched engulf the small house she had called home. Her fingertips burned, and her hair singed. Some who watched her crossed themselves, convinced she was soulless for she showed no emotion at all. Calm and dispassionate, even when the screaming started that quickly turned to bellows of agony before dying into nothing but the roaring of the fire. Teagan Harper is barely ten years old when she finds herself orphaned and sent away to live at Raven's Peak, a Gothic estate on the seaside cliffs of Maine. Soon, though, her heartache and loneliness are tempered by a blossoming friendship with the only other child living at Raven's Peak: Kane Doyle, only two years older than Teagan and abandoned by his mother. Over the years, the pair grows inseparable. First they're pranksters and confidants, but eventually their feelings change, and best friends turn into soul mates. Greyson Ratcliffe. I met him at 16, the hot new guy sitting on my jetty, an aspiring artist just passing through. He was my first kiss and my first love. I wanted forever with him. I didn't even get a year. Five years later, I'm a budding writer who scripts stories of love and struggle, the good and the bad and the ups and the downs. He's a star on the rise - his wicked talent and crazy good looks have his face plastered on countless magazines. We move in two different worlds and still our paths cross again. We're older and wiser and as crazy about each other as we had been as teenagers. My medium is words and my imagination is limitless, but not even I could have written the incredible journey we traveled to reach our happily-ever-after. Life isn't like fiction, and the greatest love stories don't follow a script. Due to strong language and sexual content, this book is not intended for listeners under the age of 18. 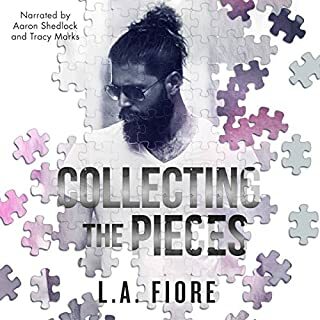 For me, the release of a new audiobook written by the talented L. A. Fiore is always very very tempting.. but when that book is narrated by Aaron Shedlock and Tracy Marks I start to mentally chant (and maybe even out loud too) “gimme gimme gimme”. And my anticipation and excitement grows as I click my way through all the buttons to make this baby mine because I know it’s going to be an epically awesome listen. 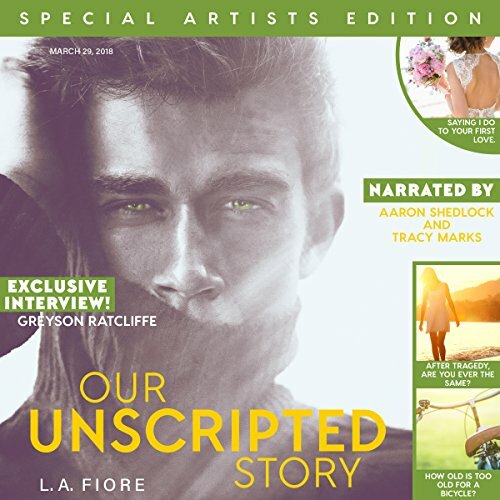 And these three artists didn’t disappoint.. L.A. Fiore has written a sweet, nicely paced, dual POV story of love at first sight between two endearing teens.. but sadly it couldn’t last long because ambitions, goals and a fast approaching end date get in the way of true love. It then becomes a beautifully touching second-chance love story when the hero and heroine reconnected years later. But their romantic relationship carries on way way past their HEA’s to span decades because Ms Fiore was far from finished with this humble loving couple’s journey.. or their character growth, their passion and pleasure, their challenges and their heartbreaking fallout from someone’s obsession. Worth a credit? Yes.. it’s an emotional, touching, romantic, multi-faceted love story with a tidal wave of feels, it’s got a droolworthy sweet Irish hero, a heroine with a beautiful yet damaged soul.. and it’s filled with wonderfully supporting secondary characters. This book came to life by the faultless narration of Tracy and Aaron who brought the magic that made a good book into a great listen. This masterful storytelling trio has done it again! This is one you don’t want to miss. I went into this book only knowing the author and narrators, and once again, I was amazed at the storytelling ability of all three. I was pulled in from the very first syllable and couldn’t stop listening. I finished in one sitting, stayed up until 5am to finish. 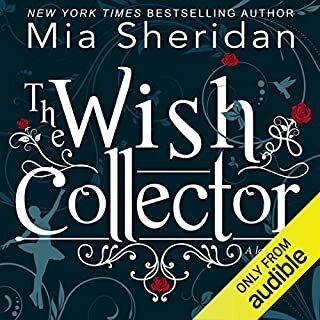 This is the 5th book I’ve listened to from this trio and, as with the previous 4 books, I was so drawn into the story that it was as if I was there, a part of the story; I felt each loss and triumph, laughed and cried along side these characters. At the risk of sounding like a broken record, it’s a brilliantly written story, beautifully told. I absolutely love the magic that happens when these three artists work together! Any book written by Fiore and narrated by Marks and/or Shedlock is an automatic download for me. This was such a great and heart warming story~ I loved every second of it. It was great how up followed the characters for most of their life vs a small chunk of time. Their love was an absolute please to watch develop. The narration was awesome! Tracy and Aaron do a fantastic job of bringing these characters to life! Aaron's Irish accent was... well.... just plain yummy! They were a great team for a wonderful story! Sometimes as you listen to a book, you are can be transported through the story taking the emotional ride with the characters. LA Fiore always does this for me, and this particular story is one easily entered into. Alexis and Greyson meet in high school, and their connection is so strong and loving. As life happens though, they are separated and their paths take them in different directions. LA Fiore can tell a story that drags you in, and invests you in the characters. It was important to me to see how these two would meet up again, and if they would find their happily ever after. Bringing such wonderful supporting characters into the story from Paige & Grant to Greyson's grandfather, gave it that family feel and you knew that there was always a support system for them. I also loved the imagery when traveling to Ireland and in viewing Greyson's art. I could see it all clearly. The story is vividly told by the talented team of Aaron Shedlock and Tracy Marks. These two have such a capacity for storytelling, I get lost when listening. Shedlock and Marks both provide a flawless Irish brogue and pull every emotion in with ease. It's a story you surely do not want to miss. Alexis has had a really rough start to life. Then in walks this amazing new guy to her high school. She thinks she doesn’t stand a chance but he seems to feel the same pull she does. Greyson is in the states to finish his last year of school before heading out on a five year tour for his art career. The two share an amazing year together before he heads off promising to reconnect at some point. And when they do it’s almost as if no time has passed! The story Greyson’s grandfather has her research is so fun and a great story. That was a huge highlight in this story for me! I also loved the ending! Aaron Shedlock does and amazing job with the accent in this book! He and Tracy Marks really bring the story to life, nailing the narration! 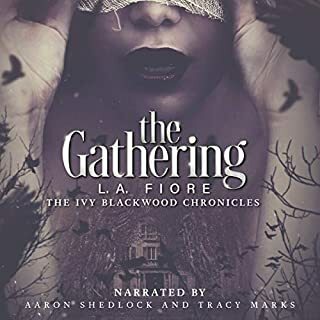 LA Fiore is one of my favoritist authors! It’s no secret. I share my love for her far and wide. I’ve adored her books for a while but I read and then listened to Savage on audio. There was something in that combination that made me fall, hard and fast. Every since then I’ve been going back and rereading and listening to what audio books I can. I swear, this author whispers her stories straight into my heart. There just can’t be any other reason that I’m left reeling days after reading her words. Our Unscripted Love was such a roller coaster of emotion. I loved every single word Fiore wrote. Everyone needs to read this and you will feel Fiore’s heart and soul. It’s completely exposed in her books. These narrators, Aaron Shedlock and Tracy Marks, are the only people who could make this story come alive like it has. Besides the fact that they speak so clear and their voices are so lovely, they give life to these characters. This trio... LA Fiore, Aaron Shedlock, and Tracy Marks is a match made in heaven! They are brilliant together! 6+++++ stars!!!!!!!!! WOW!!!! An incredibly unique and beautiful love story of EPIC proportion!! First, everlasting love, second chances and family... this story had it all! I adored Greyson and Alexis - you could feel their electrifying connection and love from that very first moment on their jetty, and although their lives took them to different cities that kept them apart for a few years, their love still burned and grew, and brought them back together. I loved their determination, commitment and passion to make their second chance at love work. I loved LA Fiore’s addictive and flawless narrative. As a reader, there is nothing more satisfying than embarking on a journey with characters that grow and complement each other in every facet of their lives. And it wasn’t only the MCs that were amazing, the supporting characters like Paige, Grant, the twins, Greyson’s grandfather and Alexis’s dad that made this story even more special. I loved the relationships that these side characters brought to Greyson and Alexis as individuals and as a couple. I wanted to be part of this tight knitted family too!! This story is unforgettable and will always be a favourite of mine. Tracy Marks and Aaron Shedlock did an outstanding job on this audiobook. Their Irish accents for Greyson and his family were spot on! I felt that they both brought so much emotion and life to these amazing characters. A couple of times I thought about skipping ahead but then something would happen and make me push thru. Tears threatened quite a few times but they’re love was just amazing ! This book brought out all the emotions, and took me on a beautiful journey. L.A. Fiore took me to a new place and time with her decadent words and storyline. She weaved a love story to make even the biggest synic swoon while simultaneously creating a story I could not put down. Dream man, meets a beautiful love story. It has been a while since I’ve read a truly beautiful love story that was so full of emotions! Worth the listen everyday of the week! I loved this story so much can not say enough good things about it. I felt like I lived Alexis life with her. She was such an amazing character with so much strength. The opening scene is so sad but opens the story so well. Greyson was such a sweetheart and I was so sad at the time they had to spend apart but I think it made them better stronger people. All the characters in the book helped make the story flow so well. L.A Fiore just always gets it spot on and this one is just the same another amazingly told story. So much happens to Alexis in her life you can't help but want to wrap her up and take care of her. Tracy Marks is just so great as a story teller she is one of my all time Favourites she is so good at doing the male voices and I loved her Irish accent. Arron Shedlock was just wow his Iris accent was spot on and I am from an Irish family he is just so good at becoming Greyson you could hear the pain in his voice during the harder parts. This book follows both Greyson and Alexis over many years and we find out how life is changing and developing for them. This is a must listen to audio book just beautiful. I will be telling all my friends to go get it ASAP. I was blown away by this book. 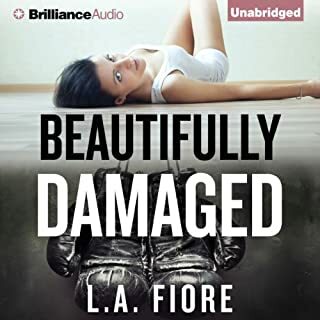 L.A. Fiore wrote a wonderful book with so many facets and emotions. I thought the narration by Tracy Marks and Aaron Shedlock was spot on. Aaron's Irish accent was wonderful! I loved how the characters knew each other for a long span of time and their love and relationship was deep. The author did a great job with the perspective of Alexis and Grayson. The book has so many realistic moments and it touches the listener with all of the emotions of loving someone. Sometimes one feels they need to go away to protect the other. Although that is often the case, its not fair. The narrators were able to deliver so many heartfelt emotions. The thought of a life without love is not a life worth protecting was an interesting concept. The story was original and thought provoking. It also has some great humor and imagery. I found this book to be a story of life lived and loved. I was glad that Grayson had not broken them, only bent them. Also, the concept that family was more than blood was so true. I will definitely be listening to this book again. I enjoyed how the story moved and was unscripted. Aaron Sherlock’s Irish accent was AWESOME! Great job by Tracy Marks too! I was rooting for Alexis and Grayson but I don’t understand why they couldn’t have stayed in touch after high school or why they had to separate after the shooting. It just detracted from what could have been a great love story.